Annan Athletic will look back on this match and know that they did not do enough to lift all three points but it was a match where the home fans were left bewildered by some controversial refereeing decisions which could have seen Annan being awarded two penalty kicks. Having said that it was a disappointing match where Annan appeared to get muscled out of the game by a Cowdenbeath side fighting to get away from the bottom of the league. Annan boss Peter Murphy included all his new signings in the squad with home debuts being presented to Evan Horne, Connor O’Keefe, Ben Armour with Cameron Salkeld the on loan attacking midfield player making his home debut in the 65th minute. Cowdenbeath manager Gary Bolland included in his line up ex Annan players David Cox and Bryan Gillfillan who featured as a trialist for the Fife side and Brandon Luke. 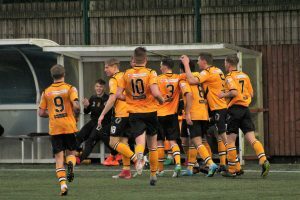 Annan started the match very promisingly and inside the opening 2 minutes they forced a corner kick which Watson headed into the path of Steven Swinglehurst but the Annan defender somehow managed to volley the ball over the bar from six yards. It turned out to be the miss of the match and somehow set the tone for the match. Minutes later on loan St Mirren attacker Connor O’Keefe was presented with an opportunity when clean through on goal but he managed to over run the ball and another scoring opportunity went a begging. It was a fine start to the game from Annan but the game then turned sour as it turned into a battle with football being at a premium as both teams suffered a lack of control with the ball in the air for the majority of the half and scoring opportunities being limited. Cowdenbeath scored the only goal in the first half in the 25th minute and it was a well constructed goal created down the right flank when Fraser Mullen’s intelegent pass over the Annan defence all of a sudden left Bradley Smith in a glorious position 8 yards out and his shot left Alex Mitchell routed to the spot. Annan failed to create any openings but in the 31st minute they had real claims for a penalty kick brushed aside by the officials when Jamie Pyper somehow got away with what appeared to be a rugby type challenge on the Annan striker Aidan Smith. After a disappointing first half Annan upped their performance in the second half and for vast periods in the second half Cowdenbeath were forced to defend their goal advantage. Annan were denied in the 46th minute by a goal line clearance following a Watson header from a corner kick. Rabin Omar went close with a good effort which went narrowly over the bar. Aidan Smith no doubt felt aggrieved to go in the book in the 69th minute after he was shouldered off the ball. A minute later and Annan won a free kick wide on the left and Rabin Omar got slightest if touches to prod the ball into the net past David McGurn. Cowdenbeath were very much on the back foot, Swinglehurst’s header in the 73rd minute went straight into the arms of McGurn. Another real contentious moment in the 79th minute when Blair Henderson turned his marker on the edge of the box and was pulled down by Jamie Pyper yards into the box, the referee appeared to award a penalty and sent Pyper off but after consultation with the stand side linesman a free kick was awarded on the edge of the box from which Henderson failed to take advantage of. The visitors were showing good resilience under pressure Rabin Omar came close in the dying minutes with a well struck free kick which went narrowly past the post. Annan will no doubt look back on the last 2 weeks results with real disappointment where they have only lifted 1 point but with 13 games still to play there are a lot of points still to be played for but Annan will know they must improve to have any chance of making the play offs. Annan Athletic – Alex Mitchell, Scott Hooper,James Creaney ( Jack Brannan 85 min), Evan Horne, Peter Watson , Steven Swinglehurst, Connor O’Keefe, Rabin Omar, Aidan Smith, Blair Henderson , Ben Armour, ( Cameron Salkeld 65 min) Substitutes not used Jim Atkinson (gk), Ayrton Sonur, Jamie Henry, Scott Roberts, Robbie Hogg. COWDENBEATH – David McGurn, Matthew McInally, Harvey Swain, Jamie Pyper, Scott Rumsby, Kyle Miller ,Fraser Mullen, Blair Malcolm , David Cox ( Ben Reilly 85 min) ,Bradley Smith ( Bryan Gillfillan 85 min), Robbie Buchanan . Substitutes not used: Blair Penman GK, Mark Fotheringham, Jordan Hornby, Craig Henderson, Brandon Luke. It was day in the SPFL where Montrose consolidated their position at the top of the table after they defeated nearest contenders Peterhead 1-0. Stenhousemuir and Elgin City consolidated their positions in the play off zones with a four goal victory over Berwick and a 3-1 victory for Stirling over Elgin City, Clyde collected the points with a last minute winner over Edinburgh City .